Prolapse of the lacrimal gland of the third eyelid is a common condition in the canine. Studies have shown that up to seventy-five percent of these prolapses occur within the first year of a dog’s life. Clinically, a prolapse is a red-colored follicular mass that protrudes from the margin of the nictitating membrane (a “cherry eye”). The pathogenesis of this disorder has yet to be fully determined. One possible etiology for the prolapse is laxity of connective tissue between the nictitans and other periorbital tissues. In young dogs, allergic inflammation may also cause secondary swelling of the lacrimal gland facilitating its prolapse. It is commonly accepted that the appropriate treatment for this condition is a permanent surgical repositioning of the prolapsed gland rather than its excision. Research has shown that removal of the prolapsed gland can significantly reduce tear production by 29 to 57%. Dogs with repositioned lacrimal glands show a less significant drop in tear production. Dogs with excised glands are also significantly more likely to develop secondary keratoconjunctivitis sicca (KCS) within 3 years of surgery. Without surgical intervention, secondary complications (i.e. conjunctival hyperemia, follicular hyperplasia of the lacrimal gland, and/or superficial keratitis) following a prolapse may arise. A prolapsed lacrimal gland of the third eyelid is associated with other ocular disorders. Healthy unrestricted movement of a third eyelid spreads lipids and aqueous fluid across the ocular surface. This will prevent the development of dry spots within the corneal epithelium which can lead to ulcerations. A prolapsed gland can physically obstruct the motion of the third eyelid preventing its important role in the maintenance of the tear film. A prolapsed gland can also prevent third eyelid excursions that physically protect the eye from trauma. Sharp and fast feline claws may catch and tear the leading edge of a canine nictitans, but this is less destructive than direct trauma to the cornea. A young dog with a “cherry eye” may appear to well tolerate a prolapse upon initial presentation. 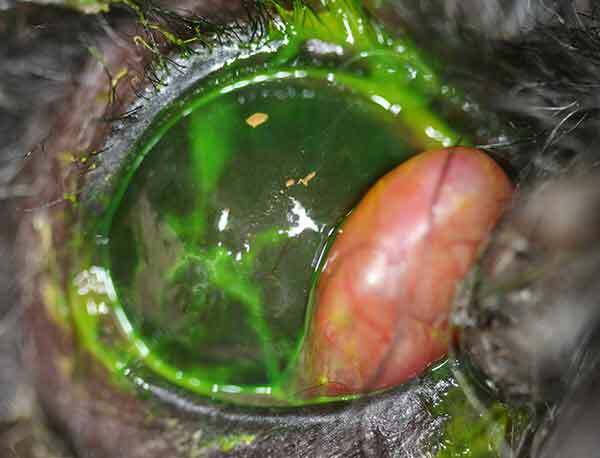 A dog with a recently excised prolapse may also present without obvious ocular abnormalities. However, tear film related complications will likely develop in both of these dogs as they age (Figure 1). As dogs mature, their meibomian gland excretions decrease which in turn increases their rate of tear film evaporation. A lingering prolapse, or an inappropriately excised gland, can exacerbate this and lead to undesirable complications. Appropriate surgical repositioning of a prolapsed gland can improve tear production and properly preserve the attributes of the tear film. If you have any questions or concerns about prolapses of the gland of the third eyelid, please feel free to consult with a veterinary ophthalmologist. Figure 1: Pigmentary keratitis and loss of vision in the right eye of a male neutered Cockapoo. The dog has had an untreated prolapse of the gland of the third eyelid for 6 years.